Which Is the Better Predictor of Hepatic Reserve Prior to Liver Resection: MELD or the Child-Pugh Score? Critical assessment of the hepatic reserve is essential prior to liver resection especially in patients with chronic liver disease. Development of liver dysfunction post resection can result in a significant increase in associated complications resulting in prolonged length of hospital stay and increased hospital costs. In addition, the development of liver failure is almost universally fatal unless the patient can undergo liver transplantation. Several scoring systems have been identified which assess the degree of liver disease including the Child-Turcotte-Pugh scoring system (CTP) and the Model for End Stage Liver Disease (MELD). Both of these scoring systems have been used to predict mortality post liver resection. 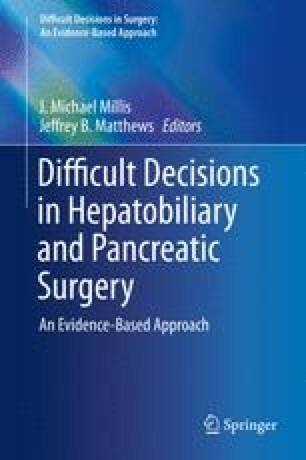 Based on the current available literature, MELD appears to be the best predictor of postoperative liver dysfunction/failure in patients with cirrhosis, and patients with MELD scores ≥9 should not be considered for hepatic resection. Other factors not included in MELD such as platelet count, presence of portal hypertension, extent of liver resection (and the resulting residual liver volume) and the presence of ascites should also be considered when selecting patients with chronic liver disease to undergo liver resection.